Home / DogLost LICKS / Well done Pawprints on your DogLost LICKS award. Well done Pawprints on your DogLost LICKS award. 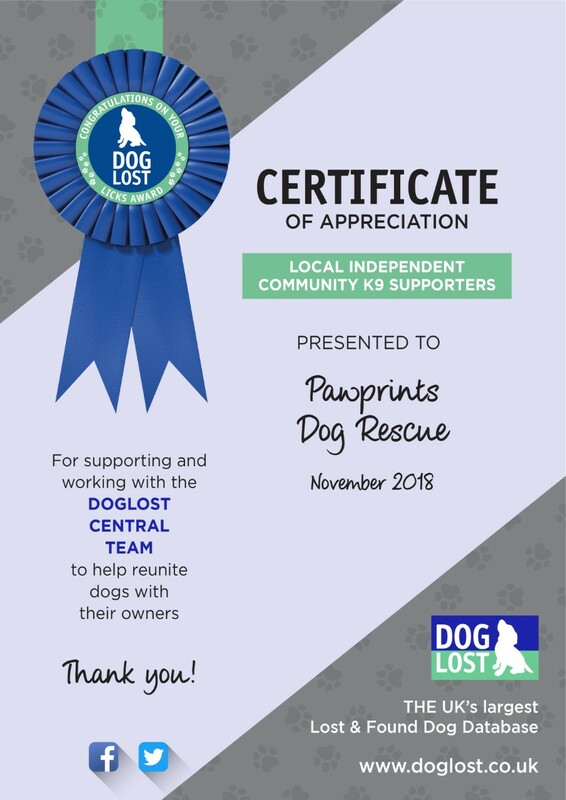 I would like to nominate Pawprints Dog Rescue for a LICKS award, they have a solid base of volunteers who spring into action whenever they are needed, they have detailed knowledge of the area & can rally a large number of people quickly to help whenever they are needed. Doglost coordinators cover large areas and the support of such local groups is invaluable. Pawprints support beyond their local area too with a proactive Twitter presence supporting lost and stolen dogs nationally and are always willing to help with advice and suggestions from their highly experienced team. This group is an interactive site regarding the extensive work of Pawprints Dog Rescue. We are a registered Charity No. 1149888. Primarily, we rescue dogs from holding kennels that are in danger of being euthanased after serving their 7 days. We also take on stray dogs that are ill or injured whose illness or injuries have surpassed the local authorities “ceiling” for treatment and would therefore be euthanased. Locally, we will assist in the search for lost or stolen dogs – all of the members on our group are asked to help in this, whether by actively searching, postering or cross-posting. Well done Pawprints! Working alongside owners and DogLost in the Rugby area.